End of first day’s play! I am very happy to say that by the end of the exhibition’s first day at Palmengarten, we’ve taken a deposit for 10 pictures! I am really pleased about this. All the months of organising, receiving botanical art pictures, delivering and hanging them in Palmengarten’s Palm house, has really resulted in a lovely exhibition. Already a lot of people have been to see it and have been duly impressed. Congratulations to all the artists and others who helped to make it happen. The exhibition of SBA members and associate members paintings will be on in Palmengarten for a further month. Therefore if you have the opportunity, please go and see it. Our SBA member living in Germany will be manning the exhibition throughout and we all owe her a debt of thanks for giving up so much of her time for the benefit of our members. Robin and I are driving back home with the van tomorrow. Hopefully it will be uneventful. The weather will certainly not be like it was a week ago when we had 26 degrees. Today it was down to 12 degrees. We are definitely into Autumn. One of the things that I regret this time, is that the hanging team were so busy hanging and organising the exhibition overall, that we didn’t even get time to walk round the gardens in daylight – as we have done on previous occasions. But, hopefully we will get more opportunities in two years time. 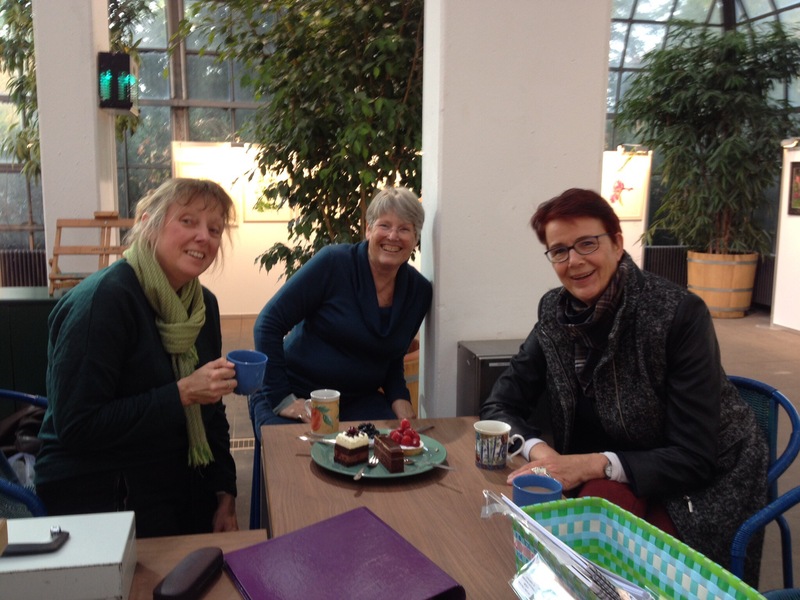 Finally, a picture of Karin Wittstock, Sue Henon and Me( with Robin behind the camera), about to put our feet up with a lovely cup of tea and a delicious German cake! < Opening day of the Palmengarten/ SBA botanical art exhibition.